Is it just me? Good. Tuesday Oct 9th: First class on ‘The Novel’, half discussing The Handmaid’s Tale, half on the nature of novels full stop. Teacher is Anna Hartnell. Afterwards went for drinks at the Birkbeck bar with a group of fellow students – something I never really did in the first year, at least not as a group. They already have become a small gang of friends, at ease with each other. It was an atmosphere of ready-made affability, which I felt flattered to join. I’ve agreed to join them on a group outing to see a production of The Tempest in December – this year’s Shakespeare text. Weds Oct 10th: First class on ‘Narratives Of The Body’. Mainly an introductory lecture on theories of the body as separate (or not) from the Self, by Descartes and others. Teacher is Sam McBean. Didn’t feel too different to the other English modules, but that will probably change when we start to look at films and non-fiction. Metropolis up next. There is too much new stuff in the world, it’s true. It’s no wonder people feel more ready to pore their energies into commenting on the few things already rich in commentary (eg news, celebrity, blockbuster movies, blockbuster art shows) rather than spend that same time and energy making new content, just so they feel less alone. A common emotion on social media is: ‘Is it just me?’ The very British herd instinct in unwillingness to stand out. It’d be nice if more of a Robin Hood approach was adopted to commentary. A redistribution of the wealth of attention. But it’s understandable – no one wants to feel alone. And so we get The X Factor, watched by lots of people who don’t even like it. It’s just the need to belong. 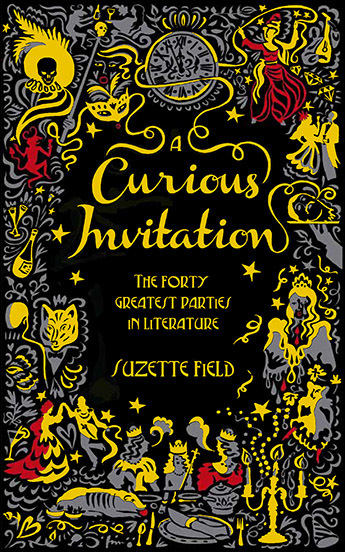 Friday Oct 12th: To Suzette’s shop in Mare Street for the private view of The Party Show, a collection of artworks with a party theme, to tie-in with A Curious Invitation. My favourites are those by Abigail Larson, Chris Semtner, Slawka Gorna and Theatre Of Dolls. There’s also a couple of Cecil Beaton prints. I chat to Rachel Garley, David Piper, Ella Lucas, and Durian Gray & Medlar Lucan, whose latest book for Dedalus is The Decadent Sportsman. Sat Oct 13th: to the Soho Theatre to see the play I Heart Peterborough by Joel Horwood. A two-hander about a drag artiste and her accompanist, who are also father and son. Full of poetic monologues that you have to keep up with, a bit Steven Berkoff but with rather more campness and music. Milo Twomey (last seen playing Sebastian Horsley) brilliant as ‘Lulu’, with Jay Taylor playing the son – and many off-stage characters in quotation – equally impressive. Chat in bar afterwards with Clayton Littlewood and Clair Woodward.